While most of my weekend consisted of packing (so many boxes, and we haven't even skimmed the surface of the crap we've accumulated), we managed to get out in the beautiful weather here in Charleston and it was heaven! First up, dressing our kid up in the cutest outfit before he grows out of it. I must say, R killed it in the picture taking department this weekend. 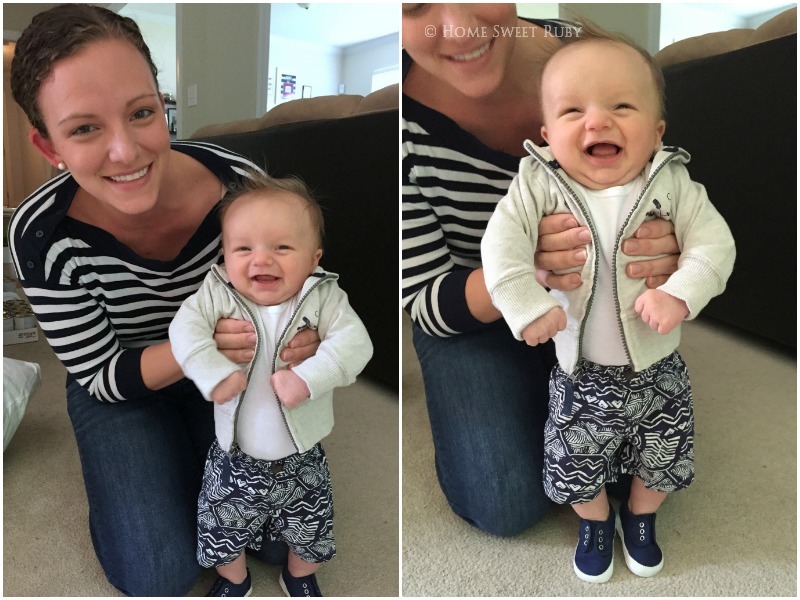 This kid loves to stand up and the moment I put his little feet on the floor he started grinning. I just wish these weren't iPhone photos. Pure joy there. I love it. Also it should be noted that he now grabs handfuls of my hair with his death grip, which naturally makes my curly hair frizz beyond belief. So I guess I'll be wearing my hair up a whole lot more these days. We headed to World Market for their friends and family sale and scored these gorgeous bar stools for our new home. I also headed downtown for brunch with Jillian, Meg, and Jessica. Sadly we forgot to get a picture together.. total blogger fail! I guess we'll just have to go visit Jessica in California to get one! Who is with me?! I did manage to snap a few pictures downtown, the weather was too perfect not to wander some of the pretty streets after brunch. This gem is from Rainbow Row, I wish I had a pink and purple courtyard like that. I hope you all had a great weekend! And if you happen to get an email from me today regarding a comment you posted like...years ago, its because I'm forcing myself to finally catch up on emails! I read every one of your comments when I get them but its tough to respond right away. Thank you for putting up with me! I'm glad you got to soak up all the beautiful weather this weekend! Look at that sweet face!!!! I wish I had a World Market closer so many great finds! I love the style of those bar stools! You know it’s always a good time if you forget a picture so brunch must have been great! Your photo of downtown is gorgeous though! Oooo those stools are SO gorgeous. You did well, girlfriend! Wow, that photo from Rainbow Row is so pretty!! I still cannot believe we forgot to get a photo - I guess we need to start planning for Cali :) Have a great week, Cait! Those Charleston pictures are gorgeous as are the bar stools, so pretty! Such a great weekend - and I have had so much luck with furniture at World Market. You snagged beautiful stools! I love charleston! It's so beautiful! And yes, those littles can seriously rip your hair in an impressive way. Charleston was showing off this weekend with the gorgeous weather! We had an outdoor wedding/reception this weekend on Folly and I was so glad that it was warm & sunny. Have a great week! I love Charleston so jealous :) Love that they had great weather!! Love that office chair, where did you get it from? Glad you got to take advantage of your perfect weather this weekend! We had amazing weather here too and I wanted to pretty much live outside! Jealous of your blogger brunch! Can't wait til I'm in Charleston and can meet up with you pretty ladies! How cute is little R?! I feel you on iPhone photos, they dominated the majority of P's firsts months - until I went to blog them and I thought "mama get your act together!" I've been really good about making sure to use both ever since! He's so cute and such a happy baby. And you know, I use iphone photos all the time :( and Sophie's nearly 16 months at this point, whoops. Hope packing goes well this week! Rowans little grin is just too much! LOVE those bar stools! Can't wait to see more of the new house! And I totally hear you on responding to emails - letting my inbox pile up is one thing I'm so bad at and then it totally stresses me out! Glad you guys had a great weekend! Charleston is so pretty! Love those new bar stools! I wish we had ones like that at our bar area. I'm trying to convince Kyle we need to change ours out, even though we just bought some about 6 months ago :) Rowan is so cute!! I cannot get over those little shoes! I'm dying! I absolutely love the bar stools you picked out - I don't think I've ever seen such cute barstools!! Oh my goodness, those pictures are adorable! His outfit is rockin' too! So sad I missed brunch. Trust me I did not want to be at work! Rowan is getting so big! I need to see him soon! It really was a gorgeous weekend!